A tin can is one of the most unassuming, humble items in a home. That's why when you use DIY skills to elevate it into stylish decor, you get to enjoy a true transformation. 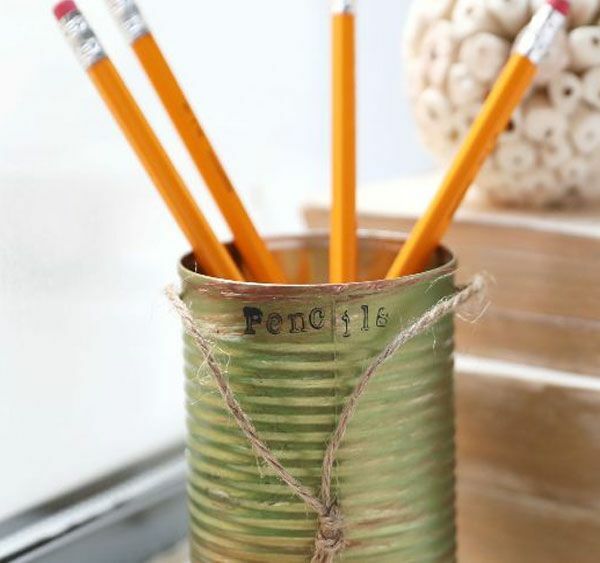 This pencil holder project retains some of the vintage charm inherent in the tin can but also takes it to the next level for a creative touch in any home. To make this pencil holder stylish enough for a modern desk, try combining two different paint colors. Layering colors over the original tin silver creates the look of aged copper. Set it next to a rose gold laptop or any other modern gadget and see how it holds its own in terms of design. 1. Place the tin can on your work surface. 2. Pour a small amount of brown paint into the glass vessel. 3. Add water to paint. Use a paintbrush or wooden stick to stir until the water is completely mixed in with the paint. 4. Place cardboard beneath the tin can to protect the work space. 5. Paint the entire can with the brown paint. 7. Pour a small amount of green paint into a clean glass vessel. 8. Add water. Use the wooden stick to stir until the water is completely mixed in with the paint. 9. Dip a clean paintbrush into the green paint. 10. Wipe some of the paint off onto the cardboard. 11. 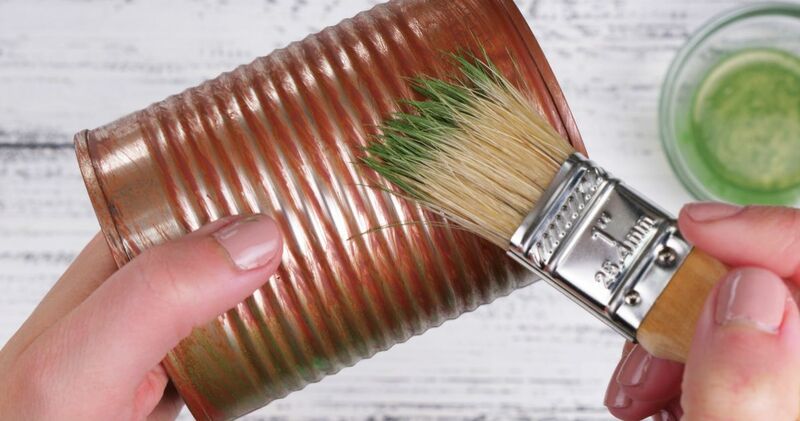 Paint the entire can with the green paint. This creates a unique copper color as the green covers the brown on the tin can. 11. Hold the hole puncher vertically, with the punch side facing down. Press the side of the can between the hole punch, and punch a hole there. 12. Punch a second hole in the can directly opposite of the first hole. 13. Pour black paint into the clean glass vessel. Do not add water. 14. Use a thick paintbrush to layer some of the black paint out on the cardboard. 15. Press the first wooden letter "P" down into the black paint. Then, dab it several times on the cardboard to remove some of the paint. Finally, press it down onto the tin can, at the top of the can, slightly to the left of center between the two punched holes. 16. Repeat step 15 for each of the letters, spelling out "PENCILS" between the two punched holes on the tin can. 17. Insert hemp twine through one hole, across the open top of the can and through the opposite hole. Tie a knot in the twine. 18. Add pencils, and place your amazing new pencil tin on your desk. Share this clever DIY craft with your friends on Facebook.